So, who exactly is Roger Alan Wade? He is a singer, songwriter and a comedian who can perform acoustically for four hours without a break and leave his audience wanting more. Or he can belt 'em out in a band with the best of them. He is a writer who just loves to write, a singer who just loves to sing and a person with a deep soul and a big heart. That's what makes Roger Alan Wade so special. Roger captures the rural south flawlessly, as result of his Kentucky roots and Tennessee upbringing. He has hundreds of songs under his belt as a writer, years of honky-tonk performing experience (with and without bands) and a commanding personal and stage presence. In addition to his numerous recordings, he has opened for and performed with artists as diverse as Hank, Jr., Steve Earle, Nicolette Larson, Mickey Gilley, the Allman Brothers and Guy Clark. You are as likely to find Roger in a library as a bar. His appetite for literature is satisfied by the likes of Ernest Hemingway, Jack Kerouac, James Joyce, Marcel Proust, T. S. Eliot and John Steinbeck. 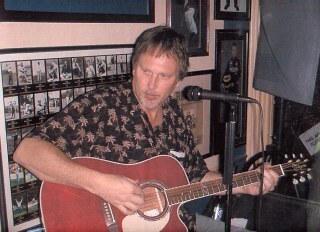 His diverse musical influences include Bob Dylan, Gram Parsons, Robert Johnson, Hank Williams and Charlie Parker.